In the last few years, more than two dozen new dangerous viruses have been discovered in Russia's North and Siberia. Among them is the new giant virus, Mollivirus sibericum, which scientists say has been frozen in ice for 30,000 years. Mollivirus sibericum is enormous by the standards of the virus world. At 0.6 microns in length, it can be observed under a normal optical microscope, which is quite unusual for viruses. Scientists from Russia's Institute of Physico-Chemical and Biological Problems in Soil Science discovered Mollivirus sibericum, and they are trying to revive the virus in collaboration with France’s National Centre for Scientific Research. Since DNA samples of Mollivirus sibericum have been preserved, it has been able to infect several amoebas. In 2013, the same Russian-French team discovered another giant virus, Pithovirus sibericum. According to Elizaveta Rivkina, head of the lab that discovered Mollivirus Sibericum, scientists were not looking for viruses frozen in the ice. The find occurred by chance. "We have been investigating the permafrost for the last 30 years, including such creatures as frozen mammoths and amoeba," said Rivkina. "The virus was accidentally discovered during the course of this work." "The study of these new viruses will enable scientists to take control of the situation," said the leading Russian virologist, Mikhail Schelkanov. "The irreversible warming in the Arctic will sooner or later lead to undesired consequences and it's better to understand them beforehand." In the last several years about two dozen new viruses have been discovered in Russia's Far North and Siberia. Almost half are located in high latitudes - on Arctic islands and coasts, in the Barents Sea and the Pacific Ocean. Schelkanov said they are in some ways like slow-motion time-bombs. "Today, infectious agents that were isolated in Soviet times are being studied actively,’’ Schelkanov explained. "At that time, there was no effective method for studying them and so they were simply preserved at low temperatures in the state's virus collection." For now it is not clear how dangerous the newly-discovered viruses are for humans. Mollivirus sibericum has more than 500 genes, which is far more than the Influenza A virus’s 11, but much less than the Pandoravirus that has 2,500. Experts say that the number of genes, however, is not an indicator of potency. "Viruses are intra-cellular parasites and they are more effective when they have a small number of working genes," said Schelkanov. Rivkina notes that the majority of viruses found in the permafrost are not dangerous to humans. She pointed out that every year tons of frozen rocks fall into Siberian rivers, such as Kolyma, but a Hollywood-style "virus Apocalypse” is nowhere near. "All mammoths found in the permafrost must pass virus control before scientists can start working with them. 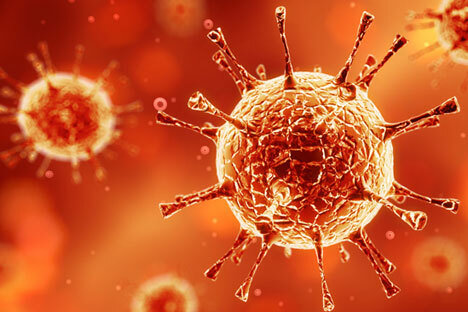 Until now, no viruses dangerous to humans have been discovered. Of course we are exploring what could happen if the permafrost melts even more, but I do not think this would necessarily lead to a spread of lethal diseases," Rivkina said.